I haven’t really answered these questions yet: what is Citizen Kane, and what does it represent? The first time I saw Citizen Kane I remained blind to its munificence, I didn’t understand Welles’ genius. I saw only a good story told in an innovative way with a surprise ending implying a simple moral about “wealth doesn’t provide happiness”. Sure, I appreciated how Welles uses deep focus, ellipsis or a fragmented chronology, but for me these techniques were simple narrative tools, not a way to shape the world, as they really are. If, as I was arguing last time, an artwork is more than a material object, then a description of this object can’t stand as a valid critic. When I write “in the suicide scene, Welles uses a deep focus that economically tells the story by condensing all the necessary information in the same shot”, I’m merely describing the film. It’s not like I’m wrong, but it’s trivial. What do these images tell us, why did Welles use deep focus instead of rapid editing? An artwork presents a singular perspective on the world, and the critic’s job is to illuminate this perspective through a retelling of his experience with this oeuvre. Citizen Kane introduced a lot of new techniques and ideas, but Welles’ innovations are less important than how he used them to frame the world, or how they were able to bring forth his vision. There’s no inherent value in originality: novelty is an historical fact and we can’t judge a technique by its mere existence (“it’s good because it didn’t exist before!”), it can be judge only by its function or on how well it accomplishes its purpose. Welles introduced all these well-known formal innovations, like the long shots, deep focus, shattered chronology or rapid editing, because he was questioning the nature of knowledge and truth through a deliberately artificial visual style; his movies are epistemological inquiries at heart. The first film project he proposed to RKO was an adaption of Joseph Conrad’s Heart of Darkness. Welles meant to translate the book’s first person narrative with a subjective camera which would have represented at all time the point of view of the narrator, Marlow. Welles intended to play both Marlow (or rather his voice, if Marlow is the camera we would not see him) and Kurtz, the person the narrator-camera-spectator was chasing through the heart of darkness. For Welles and Conrad, form is content, Marlow’s narration is the real subject of the book, not the anecdote itself, and with his choice of mise en scène the filmmaker wanted to give prominence to Marlow’s fascination towards Kurtz, their kinship even, while at the same time including the spectator in this identity quest by using this subjective camera that would have merged the perspective of the narrator with the point of view of the spectator. This ambiguous identity of Kurtz/Marlow is the perfect example of Welles’ artistic persona (while he was working in cinema) which was divided in two parts, seemingly antagonist but really complementary, that roughly corresponded to Welles the filmmaker and Welles the actor. Kane (Citizen Kane), Quinlan (Touch of Evil), Arkadin (Mr. Arkadin), Welles’ specialty as an actor were these megalomaniac tyrants, these demiurges who abuse of their power through fictions they plant around them, of which Kurtz would have been the apex. Welles knew that he was an artist living in a media world, so, more than anybody else at that time, and not unlike his own characters, he liked to manipulate his public image (by lying on his childhood for example), or, more precisely, he was building his own image while tearing it down in the same gesture (F for Fake). But if Kane, Arkadin and Kurtz appear despotic, unlike Welles (although we do sometimes have this idea of him), it’s because their lies do not concern art. In classical art, being and appearance have to be united (meaning a chair has to look like a real normal chair), but Welles is one of the first in mainstream cinema to dissociate them. This rupture, or more to the point this antinomy, dictate at once his visual mannerism, his work on his own image and the structure of Citizen Kane, Mr. Arkadin and partially also Heart of Darkness, three scripts that use as a central motif a quest for identity in a world of fake (which is also at the heart of F for Fake). Obviously, there’s always a subjectivity at work behind any piece of art, but in a classical esthetic the artist tries to hide himself behind the representation: it has to look “realist” or “objective”, the human presence must not be felt. The Aristotelian mimesis is an imitation of nature, which has to be perfected through art, but Welles doesn’t try to imitate nature. On the contrary, his subjectivity is so powerful that the frame explodes under this great pressure, and so we have these shots with extreme deep focus, ostentatious lighting and these strange expressionist camera angles. Sure, we can still identify the persons or the objects on screen, Welles is no abstractionist, but the perspective is not natural, and the presence of the camera in every scene is made visible. By thus hindering the resemblance of a subject to his image, Welles was going against all of Hollywood esthetic norms: to realism he substituted artifice, to an invisible style he preferred an obvious camera, and to the transparency of a subject he favored his opacity (there’s no easy definition of Kane or Arkadin). This breaking of the tradition was necessary: we are living in a world of appearances and uncertainty, and so for Welles, if art presents itself as an appearance among others, it can thus create truth. As many have noted before, the key figure in Welles’ cinema is the forger. But the forger can’t be defined as a simple liar or a cheat since the original model of the forger’s copy is already a fake. Where can you draw the difference between truth and falsehood if everything is appearances? Take Quinlan for example, Welles’ character in Touch of Evil, who plants false evidence to convict real criminals: are we in a position to judge him? Is judgment even possible in a world without truth (think of Welles’ adaptation of The Trial)? The artist is similar to the forger in that he uses appearances to make his model, but he’s different because he doesn’t try to fool the audience: Welles’ artifices are presented as artifices, unlike Quinlan who has to conceal his trickery. The artist is like an honest forger, he’s shaping the world through his perspective, and he can thus create truth. Truth, then, is a process, following the French philosopher Gilles Deleuze we could say it’s the process of creating something new. 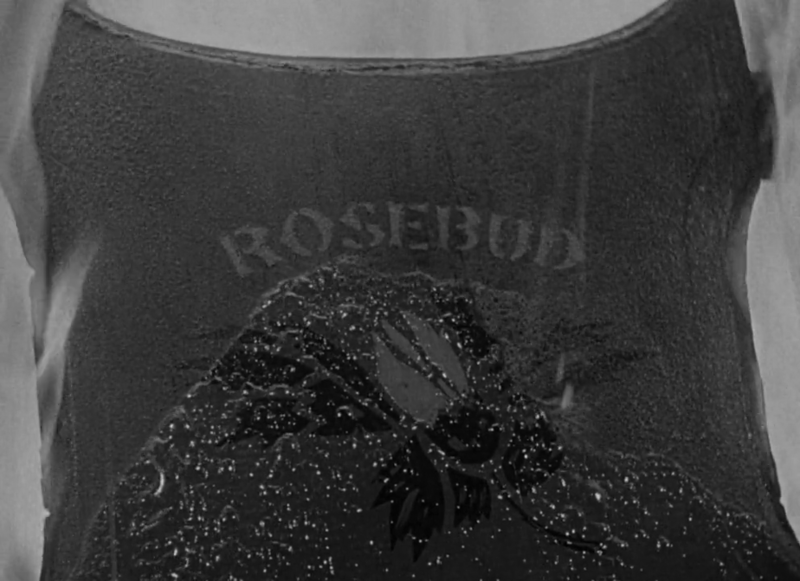 The truth of art is shown in the famous ending shot of Citizen Kane: the journalist will never uncover the identity of Rosebud, but Welles’ camera sure can, by travelling through a cluttered warehouse until it finds the answer everybody was looking for just before it fades out forever, and thus giving to the audience a certain knowledge of a truth that will remain hidden for the characters. There’s no definitive answer about Kane, the journalist is wrong from the start: Rosebud isn’t the only key to understand Kane, it’s only one of them, no more valuable than all the memories of the persons interviewed during the movie, or the actuality reel at the beginning. These perspectives are also a part of Kane’s identity, but the journalist doesn’t see it: he thinks that these stories are part of Kane’s myth, that they’re only fictions and so he wants to go behind them to find the truth. He doesn’t understand though that, first, truth is not behind the fiction, it is buried inside, and second, he’s looking for one simple answer where none exists. 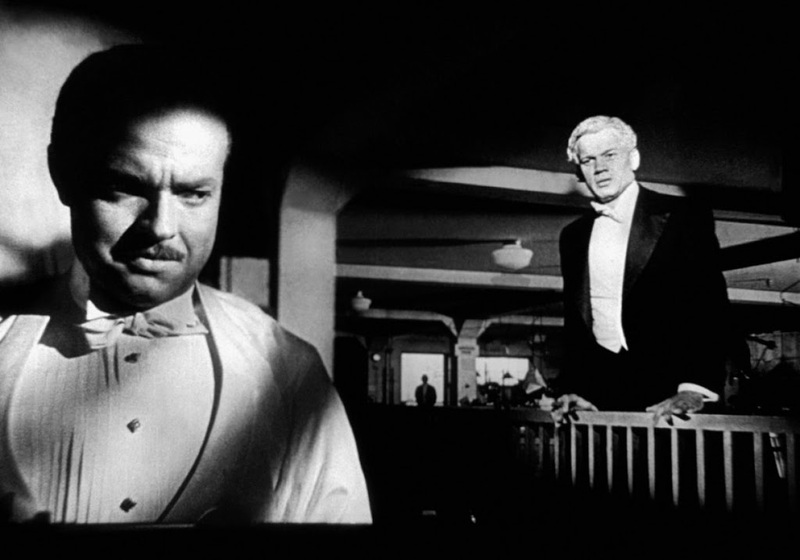 Contrarily to the journalist, Citizen Kane can approach the truth about Kane because its structure reunites different perspectives on him, but then again, the movie isn’t really about Kane, it’s about how (or if) it is possible to know someone, especially when this person tries to conceal his past and impose an image of him. Truth is not only fleeting, it is also partial, there’s no objective truth about Kane, and anyway if it exists it’s unreachable and useless, so the only way to get closer to truth is by comparing and intercutting different perspectives on a subject. And even then, truth is not really at the intersection of these perspectives, but in the process of comparing them, i.e. in the act of editing. By definition, a perspective is subjective, it’s an interpretation of reality, so we cannot reduce Citizen Kane, for example, to the lost childhood of Kane, like many seems to do, it is only one perspective among many, in that case the filmmaker’s one (he’s moving the camera for us to see his Rosebud, it is his interpretation of his character). “Wealth doesn’t provide happiness”, as I first thought, would be a very shallow interpretation of this movie (although it’s not entirely wrong either): Kane’s solitude is not a result of his lost childhood, more profoundly, and like everyone, he’s lonely because nobody can know who he is. Kane comes to realize that he is, as we all are, nothing but appearances (maybe more so in his case because of this myth he creates around him), and that we all have to live alone with ourselves since we can only be known through these appearances (that can be more or less reliable, but necessarily shallow and insufficient). At the beginning of the movie, Kane is imprisoned in his mansion, inside these black impenetrable walls and closed gates. “No trespassing” says the sign, we can never know what’s behind, but the camera do trespass, art can go past these appearances, but only to get a fleeting image of Kane (in this scene we can only see his lips and his hand). Likewise, in the final shot of the movie, the sleigh itself has no importance, it could have been any other object. What’s of significance though is that the sleigh is burning, and that nobody at that point is still looking for Rosebud: like Kane, our lives are empty, there’s no meaning to look for, and we are nothing but ashes when no one wants to remember us anymore. Art can thus create meaning where there is none, and capture a truth about Kane, which is not the answer(s) at the end of the story, but Citizen Kane, the movie itself, and how we can view the world through it. So, by presenting a world of falsehood in which a search for truth is made possible by an esthetic of artifice, Welles was able to articulate his investigation on the possibilities and the limits of knowledge, while at the same time offering a portrait of the modern man living in a world newly invaded by images. This approach and these themes are typical of modern art, and Welles is one of the first to bring this modernity in what was seen as an industrial and impersonal media (especially since he was working inside Hollywood, although he was cast out after Citizen Kane). So, yes, Welles is an important stepping stone for the acknowledgment of cinema as an art form, Citizen Kane showed that it’s possible to use the tools of an industry to shape a strong and personal vision of the world, but it wasn’t the first movie to do so. Chaplin, Keaton, Murnau, Hawks, Renoir, Stroheim, many directors before Welles presented through cinema their personal vision; Welles’ authorship was merely more obvious, more imposing. Welles’ artistic approach was (and still is) particularly relevant, he offered us one of the most precious and pertinent perspective on the world in the 20th century, and ultimately this is all that matters. Coming back to our initial question now, if this is what Citizen Kane represents, is there an equivalent in videogames? Well, no… But the long answer will have to wait for another time.